Our complete rebranding and website design for Calgary PPF has made a significant difference in the company’s overall performance and online presence. As Calgary PPF serves a number of high-end clients, we gave the site the royal treatment. 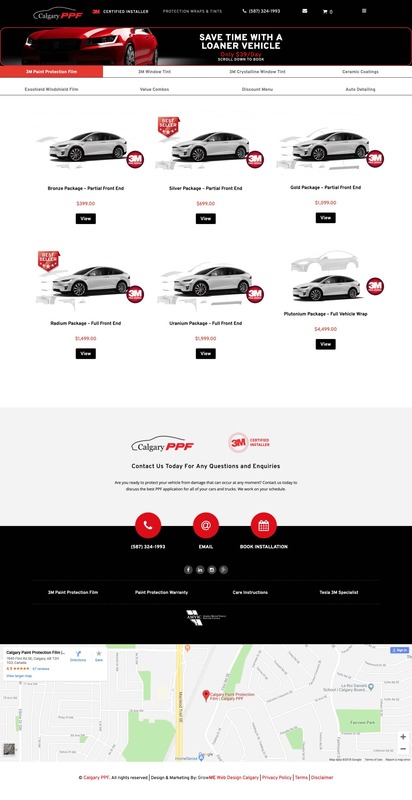 Our expert designers took great care in giving the website a classy and luxurious aesthetic to reflect the feeling of driving a high-end luxury vehicle. We added custom graphics to represent the details of each package. Because of the nature of the business, Calgary PPF needed a site that allowed for seamless integration of online booking and back end management. Overall, the website is high performing, responsive, easy to navigate and fully optimized for SEO.